Have you ever noticed that some days you are able to breeze through your various tasks and demands, and others, even the smallest set of chores seems to get pushed around and shoved in different directions, none of which lead to completion. For some reason perhaps because I feel that the warm weather and spring is just around the corner, I too, seem easily distractible. My own attention span is definitely jumping from one subject matter to another. Perhaps, its the extra sunshine or just being antsy, its a good time to write and share some thoughts regarding "attention". I do love neuroscience and how it helps me with coaching my clients and hope you will find the content helpful. 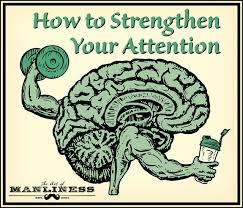 #1) Focused attention: Focused attention is commonly thought of as attentiveness. It is our ability to focus on one thing while excluding other things in our environment, real world examples of this are when we are studying or driving. #2) Sustained attention: Our ability to maintain a steady response during nonstop and repetitive activity is referred to as sustained attention. It is also defined as the ability to concentrate on one task for a continuous amount of time without being distracted, for instance staying attentive during a long meeting. #3) Selective attention: When you are able to “select” what you pay attention to, you are using your selective attention. This refers to the conscious act of focusing your attention, in other words, your ability to avoid distractions from both external (e.g. noise) and internal (e.g. thoughts) stimuli. A good example of selective attention is being able to focus on a friend’s voice in a loud and crowded room. #4) Alternating attention: When you shift your focus of attention and move between different tasks having different levels of required comprehension you are practicing alternating attention. An example of alternating attention is reading a recipe (learning) and then executing the recipe (doing). #5) Divided attention: Most of us are familiar with divided attention, also known as multitasking, which is our ability to respond simultaneously to multiple tasks. When we are able to process two or more responses or react to two or more different demands simultaneously, we call upon our divided attention skills. There are an abundance of real world examples to highlight divided attention: checking email while listening in on a meeting, talking with house guests while preparing a meal, and the list goes on. Can We Improve Our Attention? Fear not, like any of our cognitive skills, our attention improves with practice. Improving our attention helps us process more information efficiently. If memory controls the bucket where our thoughts get stored, then attention is the hose that fills the bucket. i.e. Brain Training helps strengthen our ability to concentrate and focus through brain fitness. How Can We Improve Our Attention? We know that being free from stress, supports our brain networks and keeps our capacity for attention and memory strong. So, let’s ease up on stress. The word stress is an overused word these days and we should make sure that we understand what causes us stress. If you are chronically experiencing stress, you also have high levels of cortisol, which combined may create long-lasting brain changes. And not for the better! Some study findings explains why young people who are exposed to chronic stress early in life are prone to mental problems such as anxiety and mood disorders later in life, as well as learning difficulties. So, be cognizant about “stress’, let’s acknowledge it, make a plan to help ease or erase it and move on. If additional assistance is required, get help. Don’t ignore stress. Get help. Secondly, recognize that our brain can change. Thanks to the science of neuroplasticity our brain areas that support focus and resilience can be trained with consistent practice in meditation. Over time your attention will improve. Fourth, Before you embark on something where you want to place your focus, know your Why? Knowing why you are doing something makes strong connections in our emotional center —limbic area— of our brain. Finally, to prevent outside factors from hijacking your attention away from what you’re meant to be doing, create a schedule for yourself. When you want to meditate, make that your priority, when you want to eat, make that your priority and schedule things according to what you need to support your health and well-being. Our jobs and careers depend on our ability to think for long periods of time. Luckily, scientific research has identified some fantastic ways to fight distraction and boost our natural ability to focus for longer periods of time.